You’d think with a title like that I’d have a beach house, a ski cabin, and a condo in Belize right? Oh, that would be nice. No. 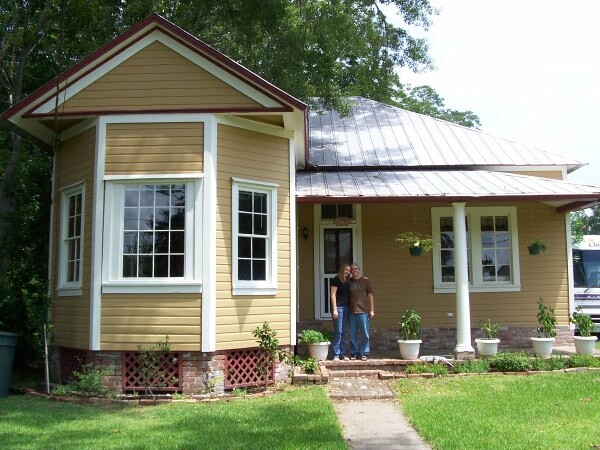 I just have one cute little cottage in southeastern Louisiana. It’s pretty adorable right? Yeah, I think so too. I’d like to transplant it right into New Orleans. We live north of the city and that has many advantages, like being relatively safe from hurricanes and low crime and about half the cost–at least is was half the cost. But the house prices are getting closer together. And that is exactly the type of thing that makes me want to house shop. It’s a hobby. I love to look at real estate just about anywhere, but when it’s New Orleans. Oh my. Greg and I both just adore the old houses. And that is what got us out of the house on Saturday. It was only 94 degrees with a heat index of 117. Perfect day for a stroll right? Yeah. That’s what I said. But we did it anyway. We are slowly narrowing down the area we want to live in should we ever have the means to actually move there. Top of the list is Algiers Point. It’s just a short ferry ride across the Mississippi from the French Quarter. This is what we went and looked at. The upstairs is a three bedroom and downstairs has two studio apartments. We were thinking one could be the studio and the other we’d rent out. It’s pretty darn cheap, but it does need some work. I mean it’s over 100 years old and in New Orleans. Everything needs work. Of course this is just speculation, cause we aren’t really moving. But it sure is fun to look. I have more fun running around looking at houses than art shopping. That’s saying something.